Having fun with a former/current follower turned podcaster +Niilo Alhovaara on his "Be Smart On Air" podcast. Out of the convertible tablets that I tested, I liked the HP x360 the most. If you want the stylus make sure to request that version at the time you purchase it, because it is not something you can easily add-on later. Ziteboard is a very simple quick web-based whiteboard that works on Chromebooks. This is my app of choice as an alternative to Smart Notebook. This video I am looking at how well the HP Chromebook 11 G5 might workout in a 1:1 Chromebook school. This particular Chromebook was provided by "The Top Floor" for my teardown presentation at VTFest this year. For this video I have done an unboxing, review and teardown of the Acer Spin 11 Chromebook. Unlike other reviews, which are often targeted at the generic consumer, I actually look at how well this device will work in an 1:1 environment in schools. Chromebook printing has always been an issue especially in a network. As of ChromeOS version 59 Google has implemented direct IP printing, which eliminates the need to use Google Cloud Print and eliminated the need to have a windows service running on a print server. Here is how you can set it up on your network. 1. 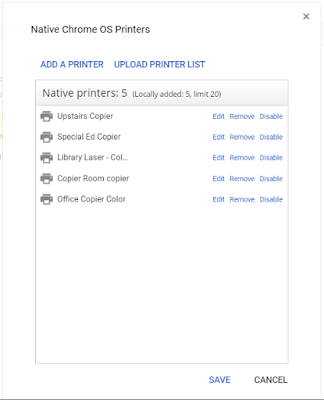 Start by enabling ipp printing on your networked printers. Each printer will be different. Some offer authentication which you want to shut off. Below are the settings from two of my printers. The below instructions are for non-SSL setups. If you need SSL you will have to make the necessary adjustments to the protocol and port number when adding a printer. 2. Next jump into the gSuite admin dashboard, and navigate to the "Device Management > Chrome > User Settings". 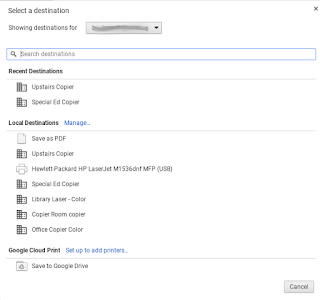 Then select the Org that you want to deploy the printer to. 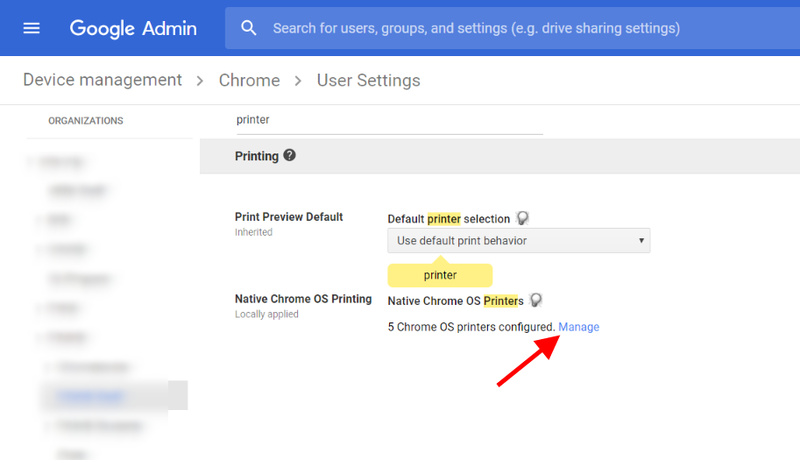 Lastly locate the "Native Chrome OS Printing" setting and click "Manage". 3. 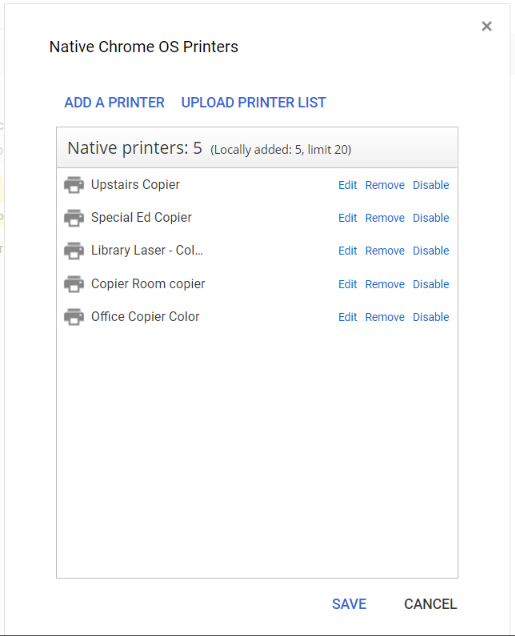 This window shows the printers you have added and allows you to add either a single or multiple printers at once. For this post I am only going to focus on adding a single printer. So click "Add A Printer". 4. 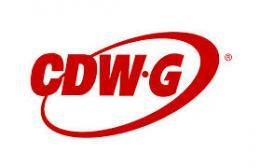 Provide the printer with a Name and the driver you want to use. 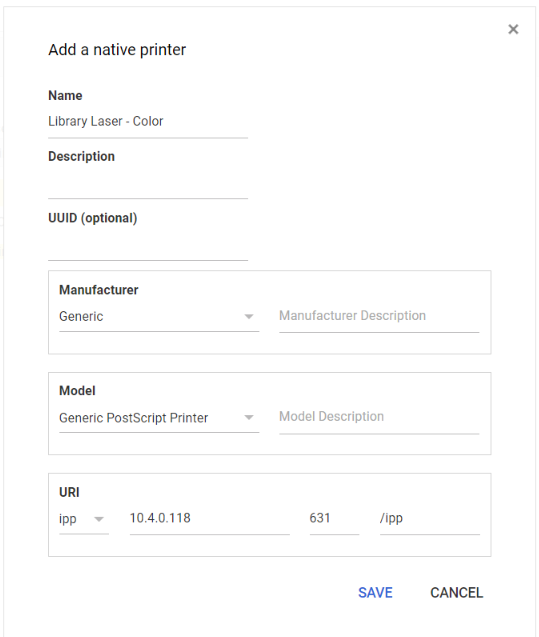 If you are lucky enough to have one of the listed printers, go buy a lottery ticket, if not then I suggest selecting "Generic" under the Manufacturer heading and then "Generic PostScript Printer" for the Model. The next part may be different per printer, or if you enabled SSL, but I would start with the below settings and tweak if they don't work. Protocol: Ipp ~ This stands for Internet Printing Protocol and a pretty standard protocol that the majority of printers have built-in. Path: /ipp ~ This appears to be a standard path needed for most printers. 5. 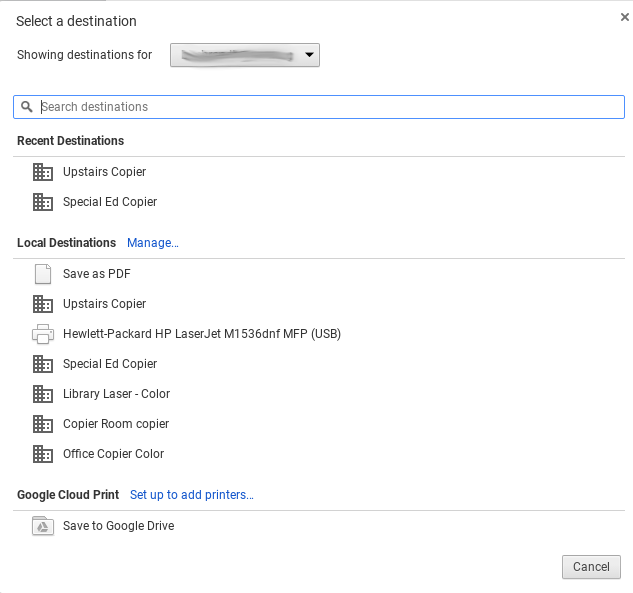 Lastly, make sure that the Chromebook is at least Version 59 or else you will not see the printers under the "Local Destinations". and clicking "Change" under the destination. Our school like many have some aging SMART boards that need to be replaced soon. We are also a 1:1 Chromebook school so I wanted to find something that was compatible with them. I found 2 setups that I really like, the Epson BrightLink Interactive projectors, and the Infocus jTouch boards. Both Interacitve devices worked instantly when connected to a Chromebook. I only got to use the Epson for a short time, but it was certainly a great tool. Being a projector it was able to cover a very large surface area. It uses a standard whiteboard, and the newer versions can be used without any special pens. The Infocus jTouch board is a different approach. It is basically a 65" touchscreen. It is very reliable, and being a TV the images are very crisp and clear. However it is only 65" which is quite small for many classrooms. I also looked at the SMART TV, and the Promethean versions. The SMART TV did not work with a Chromebooks and cost over $4000, while the Promethean was a very nice alternative, and one I certainly would consider, however it's cost was in the $3000-$4000 range. The jTouch starts just under $2000 which makes it very appealing interactive board. To Promethean's defense they are a 70" 4K TV where the jTouch is only a 65" 1080p screen, so the extra cost is justified. When moving away from SMART, it also meant moving away form SMART Notebook. This actually has proven to be the harder task. While I can get the SMART Notebook separately now, and they will work with both interactive setups above, it doesn't work with a Chromebook. So in my research I have come up with 2 tools that I thought were very well built and were necessarily to show teachers when introducing them to the new interactive hardware. The first one is Web Paint. 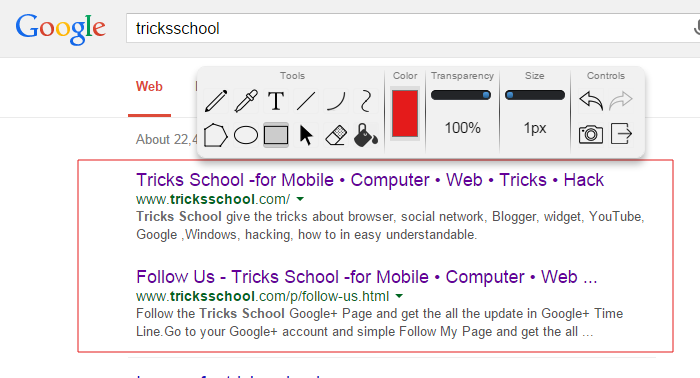 This is a chrome extension that will allow the user to annotate over any webpage. It works with touch and is quite intuitive. The next one took me a little longer to find, and that was an actual whiteboard. There are a lot of them out there, but none that really stood out. https://app.ziteboard.com/ was the first one that I felt was clean, collaborative and ready to use out of the box.